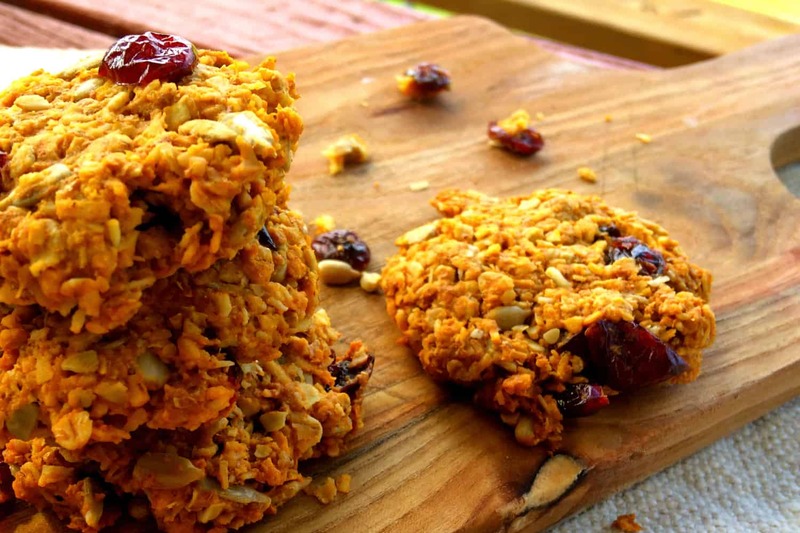 It’s 9am and I’m sitting at my computer with a cup of tea and two of these super yummy cookies I am about to introduce you to. Lunches made, Kids are at school, ducks and chooks fed, (very) basic house clean done, rubbish recycled, washing on the go, a couple work calls completed. Seriously. Where is my Super Mommy badge. Where? Coz I don’t see it. It’s easy to sit back once it’s all done and tick off the list but when you’re in the thick of the morning run it feels a little (OK, a lot) chaotic. Child #4 forgot to take his swimming clothes out of his bag all weekend. So now they smell terrible. and he has to wear them again. 1 Child in tears. Child #2 decided he needed to wash his hair (teenagers and their hair are a whole other story) in the room that also houses the household toothbrushes. So lineup outside the bathroom caused a little conflict. God forbid we see each other naked in this family! Child #3, 1, and 4 all left their lunchboxes in their bag over the weekend. That was fun. Real food doesn’t keep so well. There was a line up and a lot of gagging at the kitchen sink this morning. Because Mommy only makes lunches in clean lunchboxes. Child #1 forgot to water the plants outside her window. For the forth day in a row. Child #1 also left a boot full of art supplies in my car. Which now smells of sour milk after the recycling bin had a small leak. Child #4 didn’t want leftover macaroni and cheese in his lunch. Tough luck buddy. Child #1 and 2 left their school shoes outside and the morning dew did a great job soaking them through. Child #2 hasn’t made his bed. And forgot his homework. Which I’m sure he will discover later. Child #3. Well. actually, she was perfect. She woke up late so missed the bathroom scramble and the Mommy meltdown over disgusting lunchboxes and still got everything ready. Why? Because this little darling has a little OCD and everything was done the night before – right down to getting her clothes, bag and hair brush ready. 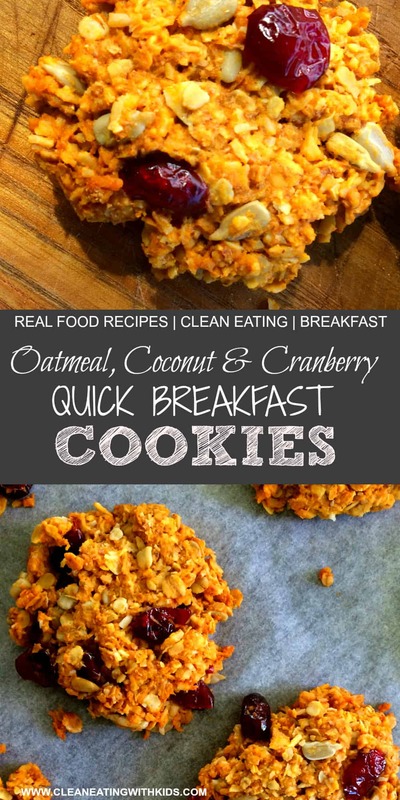 Which brings me to these gorgeous Oatmeal, Coconut and Cranberry Cookies. The reason you are here. Every single one of my children #1 through to #4 grabbed a couple of these on the way out the door. Breakfast on the go because the school bus waits for nobody. Seriously, the bus driver gets an absolute thrill driving off at exactly (E.X.A.C.T.L.Y) 8am and watching you chase him down the road until the next stop (8 minutes away). I know he saw me that day. I just know it. Preheat oven to 180’C / 350F. 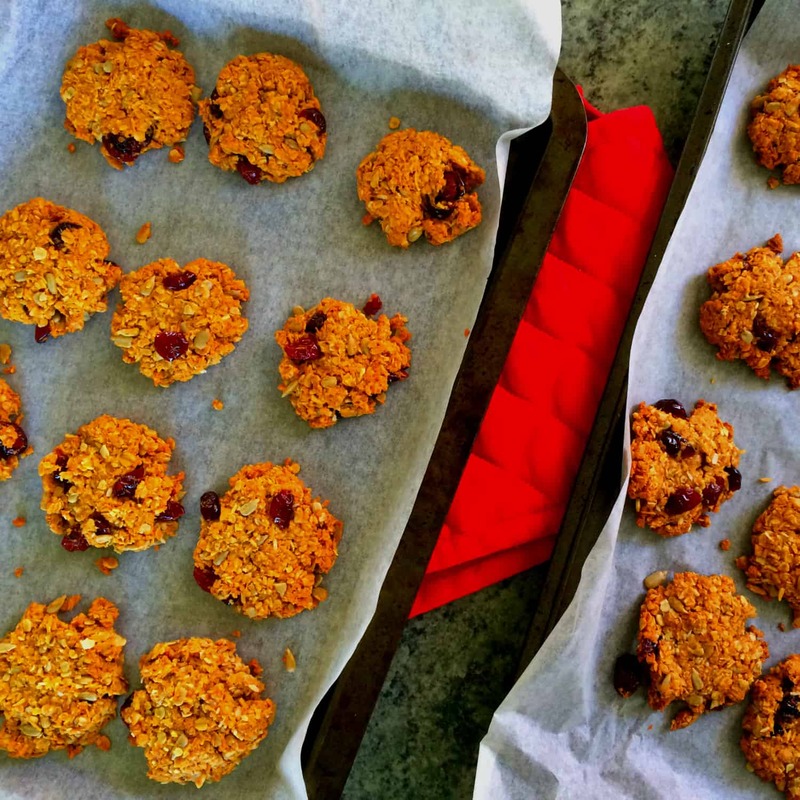 Prepare two 8x13inch baking trays with parchment paper..
Place flour, oats, coconut, cranberries, sunflower seeds in a large bowl. Melt the butter and honey together in a saucepan until just melted. Combine baking soda and warm water to dissolve and add to butter/honey mixture. Immediately add the butter mixture to the flour mixture (as baking soda starts to work as soon as it mixes with the honey) and mix well until well combined. 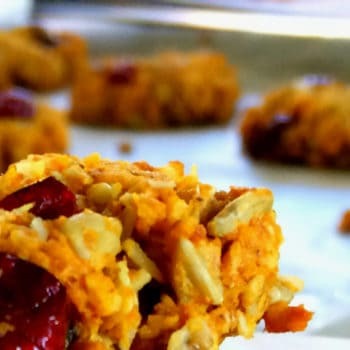 Place tablespoon sized balls of cookie dough onto the tray and flatten as much as you can without breaking the cookie. Remove from oven and let the cookies cook in the tray for around 10 minutes before moving them onto wire racks to cool completely.